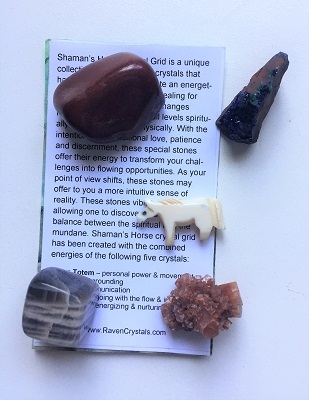 Shaman’s Horse Totem Crystal Grid is a unique collection of Reiki attuned crystals: Horse Totem, Azurite, Moonstone, Aragonite, and Red Jasper gathered to create an energetic grid offering support and healing for personal growth due to the changes happening in our lives on all levels spiritually, emotionally, and physically. 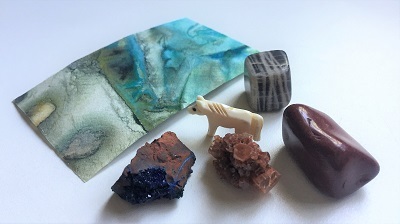 With the intention of unconditional love, patience and discernment, these special stones offer their energy to transform your challenges into flowing opportunities. As your point of view shifts, these stones may offer to you a more intuitive sense of reality. These stones vibrate in harmony, allowing one to discover and practice the balance between the spiritual and the mundane. Carved bone Horse ~ Horse symbolizes power, travel and freedom. Horses are thought to have physical unearthly power. Found in shamanic practices throughout the world, horse has enabled shamans to fly through the air and reached the heaven. In understanding Horse, one must learn to strive for balance between personal freedom and relationships. Horse helps one understand that true power is wisdom found in remembering your total journey is about experiencing compassion, caring, teaching, and sharing your gifts, abilities, and LOVE. Horse does not like to be restrained or be constricted. Horse represents action and movement. Learn from the Horse to ride into new pathways to awaken and discover your own personal freedom and power. Aragonite ~ Brown-white Aragonite is a grounding stone fostering patience and acceptance, encourages discipline, reliability and a pragmatic approach to life. Aragonite centers and grounds physical energies so it may be useful in times of stress. Aragonite helps to lessen anger and emotional stress. Aragonite restores balance for meditation by raising vibrations to a high spiritual level and brings energy into the physical body. Aragonite stabilizes the base and earth chakras. Azurite ~ Sparkly dark indigo blue guides psychic and intuitive development. Azurite cleanses and stimulates the third eye and attunes to spiritual guidance.Azurite facilitates entering a meditative and channeling state. Azurite brings about clear understanding and new perspective, releases long-standing blocks in communication and stimulates memory. Azurite also clears stress, worry, grief, sadness and transmutes fears and phobias. Azurite calms someone who talks too much out of nervousness or encourages someone who holds back from self-expression. Moonstone ~ Light grey pink to soft peach colored and softly banded patterned Moonstone is a stone of new beginnings, strongly connected to the moon, feminine energies and to the intuition. Moonstone has a powerful calming effect on the emotional state. The energies of Moonstone are balancing and very helpful to those adapting to the changing of structures in their life on all levels. 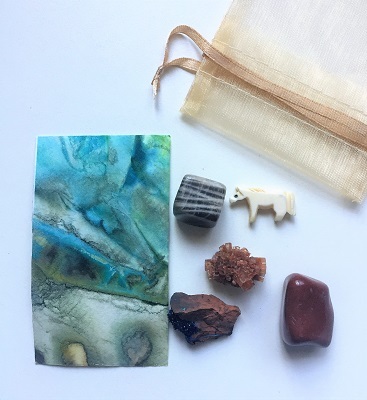 Moonstone facilitates intuition and reflection allowing one to gracefully acknowledge the cycles of “up and down/pull and release” and to go with the current of flow instead of struggling against it. Moonstone enhances the awareness and appreciation for Divine Timing. Moonstone enhances perception and discernment, enabling one to respond with patience and to make decisions which painlessly further one’s development, diminishes obstacles, and assists one in the total fulfillment of one’s destiny. Moonstone stimulates confidence, composure, and enhances the positive attributes of creativity and self-expression. Moonstone fosters tenderness and happiness within our self, with others, and in our environment. Red Jasper ~ Brick red colored Red Jasper grounds energy. Red Jasper brings problems to light before they become too big and provides insight to the most difficult situations. Red Jasper makes an excellent worry stone, as it is calming for the emotions. Red Jasper stimulates the base chakras and is energizing. Red Jasper cleans and stabilizes the aura and is a stone of health and well-being.